AN ISO 9001:2008 Certified Company 3rd Largest Exporter, Suppliers, Stockholder, Dealers & Manufacturers of Pipe Flange | Pipe Fittings and high nickel alloys. Excel Metal & Engg. Industries continues to meet customers’ needs through global quality standards from original design to distribution. 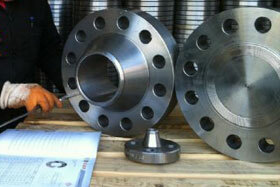 Pipe Flange & Pipe Fittings produced in our Mumbai factory, carries a promise of quality and consistency. Excel Metal & Engg. Industries manufactures to global standards. We are one of the leading importer, stockholder, suppliers & exporters dealing in Pipe, Pipe Flange & Pipe Fittings since 1990. When procuring raw materials to manufacture Pipe Flange & Pipe Fittings, our primary responsibility is to ensure that same quality and consistency exists in our supply base. JINDAL STRIPS, SAIL, INDAL, BALCO, HINDALCO, MUKUND, MUSCO SHAH ALLOY etc. As well as IMPORT SOURCE TO GETTING a continuous inflow of materials. At Excel Metal & Engg. Industries, quality is not only the durability and defect free nature of product but its use and applicability to fulfill the sole purpose for which it was bought. AND HUNDREDS OF SMALL SCALE/BIG INDUSTRIES SPREAD THROUGH OUT OF INDIA.